As the Arctic has experienced rapid warming over the past several decades, permafrost in tundra ecosystems has been melting, allowing the carbon that has been stored in the frozen soils for millennia to become more active. A major concern many scientists have had is that as the permafrost warms, the carbon stored in the soil will be released into the atmosphere as the greenhouse gasses carbon dioxide and methane, which would contribute to further warming of the planet and create a positive feedback warming cycle. Are there other sites around the Arctic looking at permafrost changes other than the one at Toolik Lake? 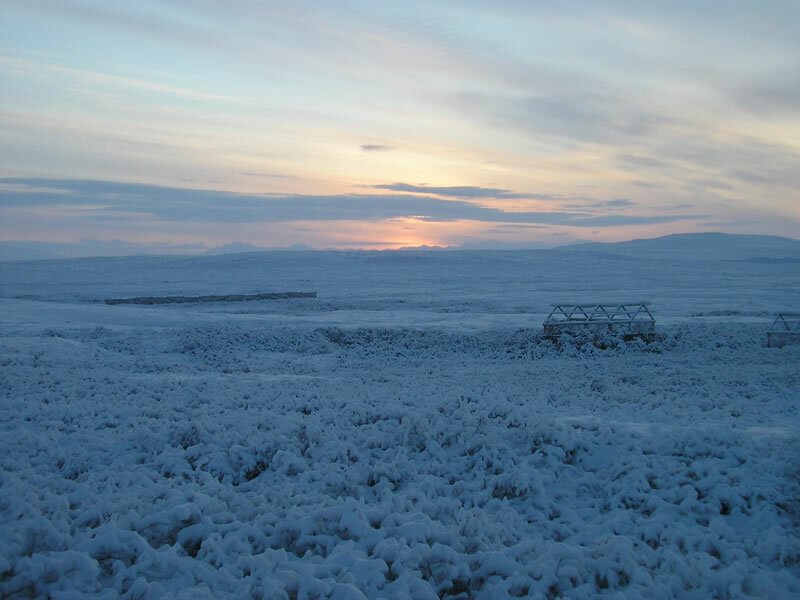 Many other researchers around the world have also been looking at how ambient warming in the Arctic is affecting plant communities and soils, using experimental setups like the greenhouses used at the Toolik Lake site. Set up in 1989, the Toolik Lake experiment is, as far as I know, one of the oldest sites experimentally studying the effects of permafrost warming. There are a number of other sites around the Arctic where researchers are studying how warming affects Arctic systems, including in: Iceland, Norway, Sweden, Greenland, and Canada. I’ve been to the sites in Greenland and Sweden. There are also permafrost warming experiments further south in the sub-Arctic. The Arctic LTER project is part of the Arctic Observatory Network, which along with the International Long-Term Ecological Research (ILTER) Network, creates global networks of research sites around the world, in a wide variety of different ecosystems. The goal of these networks has been to get a global perspective on the environmental changes that are happening around the world through long-term, site-based research and monitoring. This global perspective is important, because the Arctic crosses many national boundaries and nearly 24% of exposed land is underlain by permafrost. There is a lot of variation across the Arctic in landscape features, soils, plants and animals. By fostering international data-sharing with sites around the Arctic, scientists gain the ability to create large-scale projects from which we can compare data and detect global trends that would likely be missed or impossible to detect if we only looked at individual sites. For example, the recent recognition that the Arctic is getting greener due to increased plant growth as the biome warms would not have been possible just from studying single locations. Similarly, our understanding of the enormous amount of carbon stored in permafrost soils globally is only possible through the synthesis of extensive, international sampling efforts. Will the Arctic LTER project continue to receive funding in the coming decades? I hope so. The Long Term Ecological Research (LTER) network is being funded by the US National Science Foundation (NSF). “Long term” is in the tile of the project, and the NSF has demonstrated a commitment to running long-term monitoring and data collection under this project. There is a recognition that ecosystem feedbacks can be critical in large-scale processes. So if your research project runs for only three or five years, you might not get the information you need on the extent of feedbacks possible in a given system. Interpretations over the short-term as opposed to the long-term could be completely different. For instance, in the short-term (less than 6 years), our experiment only warmed the soil during the summer, when the greenhouses were directly active. Over the long term, however, summer warming drove an indirect (and much stronger) winter warming effect by increasing snow-insulation of the soil. We would never have observed this winter warming effect (and its biological consequences) had we ended the study after 5 years. One unfortunate thing I should mention is that the greenhouses are small, so there is a limit to the number of times you can take destructive samples from the soil contained in them. For example, in 2008, we only looked at plant cover instead of looking at plant biomass as well, since looking at plant biomass means taking a block of soil and the plants they contain out of the study plots - a destructive sampling process. You can only do destructive sampling so many times before you have no more things to sample. So we aren’t able to do destructive sampling that often. Not being able to take many samples is a problem in a lot of these ecosystem-level manipulation experiments like the one at Toolik Lake. There’s only so much ecosystem to work with. You have to be quite picky when it comes to sampling. I was very fortunate to be able to sample the soil and plants extensively with collaborators, which allowed us to collect and synergistically analyze a lot of important data relatively quickly. To what extent will the results of your study be factored into models looking at the potential release of carbon into the atmosphere? Some of the things our study points to is that understanding how changes in the plant community on the Arctic tundra can affect changes in the decomposer community in the soil are useful for models of decomposition carbon cycling. Newer generations of models are trying to add microbial feedbacks into larger-scale models. Something a lot of climate models can’t currently do is incorporate plant-soil interactions and feedbacks and how they can affect atmospheric greenhouse gas concentrations. So by putting in a more detailed mechanism for ecosystem response to warming, this helps us to get better predictions of carbon loss in these models. I’ve also been doing some modelling work that compliments this work to look at the feedbacks between warming, changing plant communities and changing soil microbe communities. What would you like to communicate to policymakers regarding the importance of the research you and your colleagues have been doing on Arctic permafrost? I want to stress that anthropogenic changes to the environment can have ecological feedbacks that may soon outpace the direct anthropogenic contributions to greenhouse gas emissions. Understanding the extent to which warming permafrost ecosystems will release greenhouse gasses into the atmosphere over the coming century is a major point of concern. Even though this study reveals some resilience in the Arctic system to climate change, ecosystem feedbacks have the potential to make what seem like small disturbances (a few degrees change in average temperature) create dramatic warming in the near future. So it's important to act rapidly now to mitigate greenhouse gas emissions. A lot of policymakers and the population in general don’t realize that effects of biosphere feedbacks from rapid climate change can ultimately be a lot larger than effects of directly releasing greenhouse gasses into the atmosphere through fossil fuel combustion. Our goal is to improve our understanding of the carbon cycle in Arctic systems and elsewhere by identifying the magnitude of stabilizing and destabilizing ecosystem feedbacks that result as a consequence of the climate warming. Hopefully this knowledge will help us to prepare for, adapt to, and potentially mitigate undesirable social and ecological consequences that rapid climate change can bring across the world.